✅REUSABLE 7 COLORS WATER DRAWING MAT: Size：78 X 78cm (30.7\'\'×30.7\'\'); Just fill the magic pen with water and draw on the water doodle mat. The marks magic disappear when the water drawing mat dries up after 3-10 minutes (depending on the temperature and air flow), kids can draw on doodle board mat again and again. Environment protection material, Non-polluting. ✅BEST ART EDUCATIONAL TOYS: There is a drawing booklet. Under the guidance of the drawing booklet, beginners can independently complete 21 different objects and animals through simple steps. Water doodle book can inspire your kid\'s unlimited creativity and imagination, exercise hand-eye coordination & the color perception ability. ✅CLEAN AND ENVIRONMENTAL PROTECTION: Water drawing board is clean and safe for kids. No ink, no paint. No need to extra cleaning. The back of the mat is made of water-resistant nylon material, mom has no worry about wetting the floor. Toddlers drawing board can be folded to compact size, portable for indoor outdoor and travel. 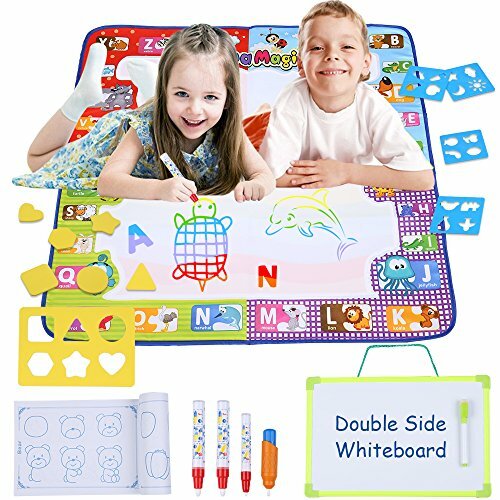 ✅MULTIFUNCTION TODDLERS DRAWING BOARD: The set included a double sided dry erase board, similar in size to an 11.8x7.9 Inches paper. This is a perfect student erase board. Children can use the marker pen to write or paint on the whiteboard. Magnet surface is easy for writing, erasing, painting, drawing. Your dry erase boards will look as clean as new with a few swipes of the eraser! ✅100% SATISFACTION GUARANTEED: Your satisfaction is our priority. We are certain that the kids are going to love this water drawing pad. If for any reason you are not completely satisfied after receiving our doodle mat, please kindly email us, we will try our best to serve you.